(G No. 4) Preliminary Chart of St. Andrew's Bay Florida. 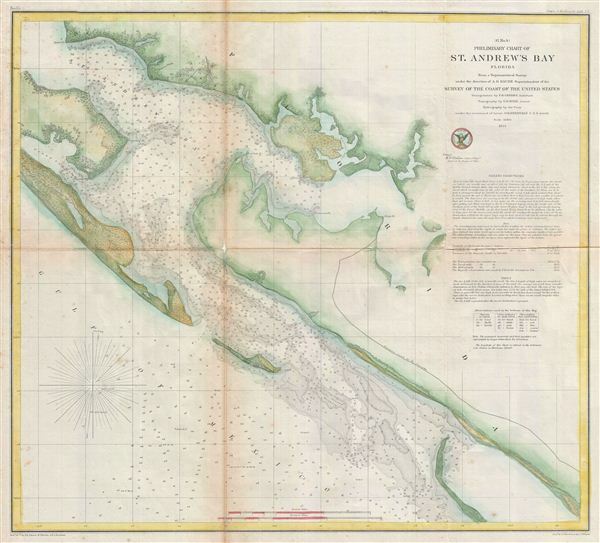 An uncommon 1855 U.S. Coast Survey map or nautical chart of St. Andrews Bay, Florida. The map identifies St. Andrews City, which would soon evolve into Panama City, the seat of Bay County, Florida. Sailing directions appear in the upper right quadrant below the title. Located on the Panhandle of Florida, this map covers the Bay, which is known for its beautiful beaches. St. Andrews Bay was the site of a vast network of saltworks critical to the Confederacy during the American Civil War. The Union naval officer edward Crissey, in command of the steamboat USS Bloomer took advantage of the shallow draft of the steamboat to sail into the bay where other, deeper draft vessels, were unable to follow. The ensuing destruction of the St. Andrews saltworks did considerable damage to the Confederate War effort. This map was drawn on a scale of 1:40,000. The triangulation is the world of F. H. Gerdes. The Topography was accomplished by G. D. Wise. The Hydrography was completed by a party under the command of G. H. Berryman. The whole was compiled under the exacting direction of A. D. Bache, Superintendent of the Coast Survey.